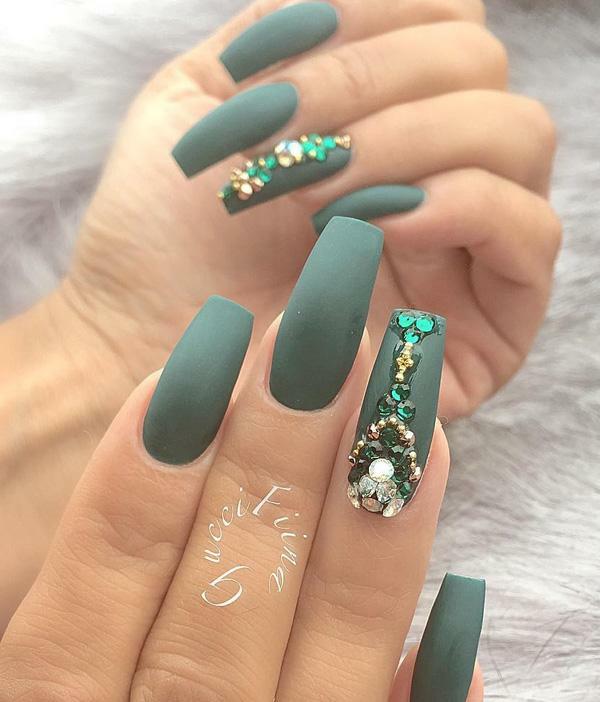 This is a very luxurious manicure, we can see earthy tones that are very popular for several seasons. Somewhat reminds me on India and its sumptuous side, I must admit. 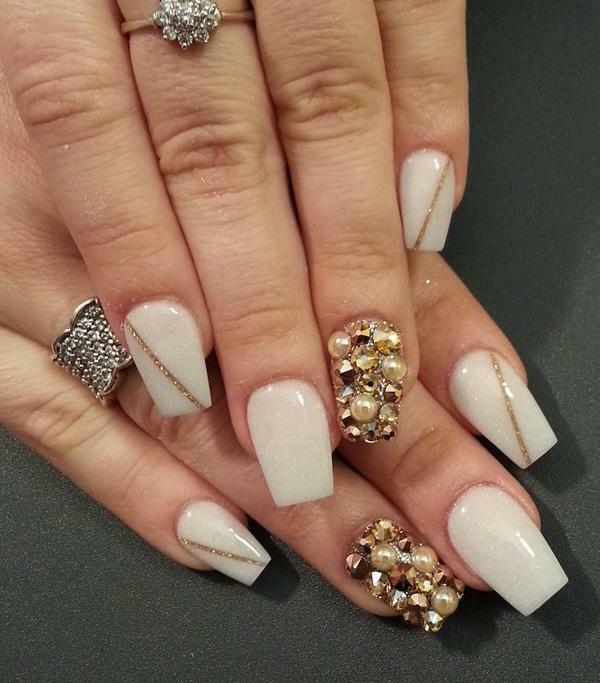 Rhinestones enrich the whole manicure, a great contribution is giving the ring on half finger. This kind of rings is the last two seasons absolute hit. 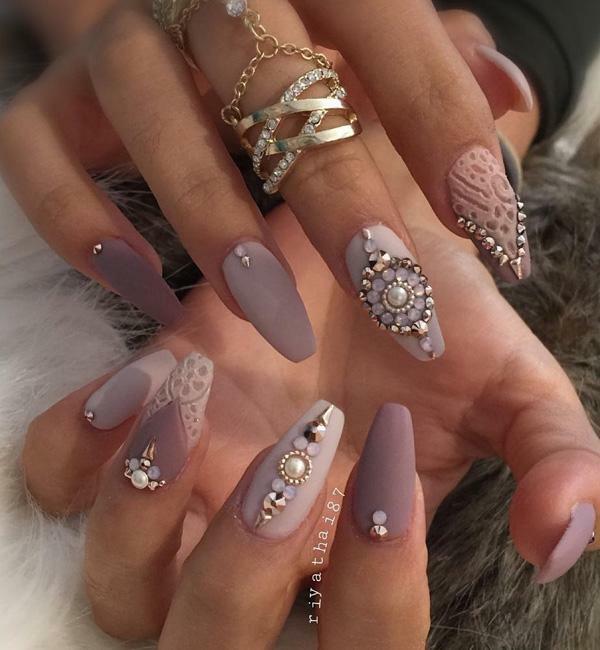 Nail decorating dates back to around 3000 years ago. Then, I addmit, they used slightly different methods of coloring the nail, using henna, for example, mixtures of bee wax, rubber, egg whites and gelatin and so on. Also, each of the stock had its own color with which paint the nails, and if a woman from a lower class backgrounds painted nails in one of the royal colors, was punished and sometimes with death. 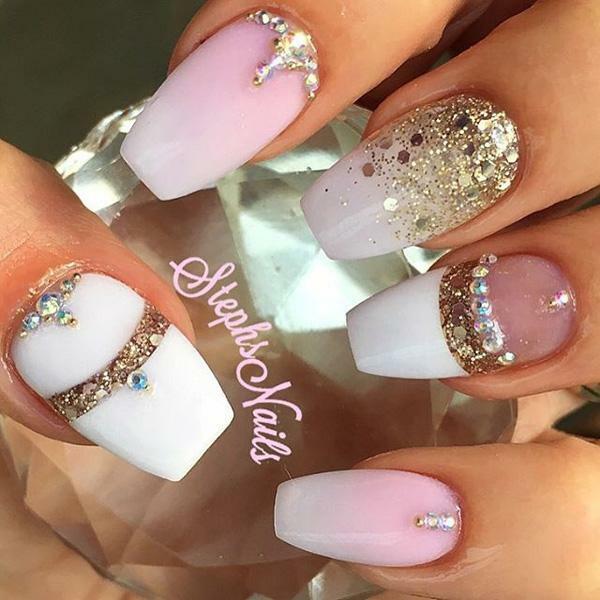 But now times have changed a bit, to all of us are available various preparations for the care of nails and polishing, and one who is the most creative will have the most beautiful nails. 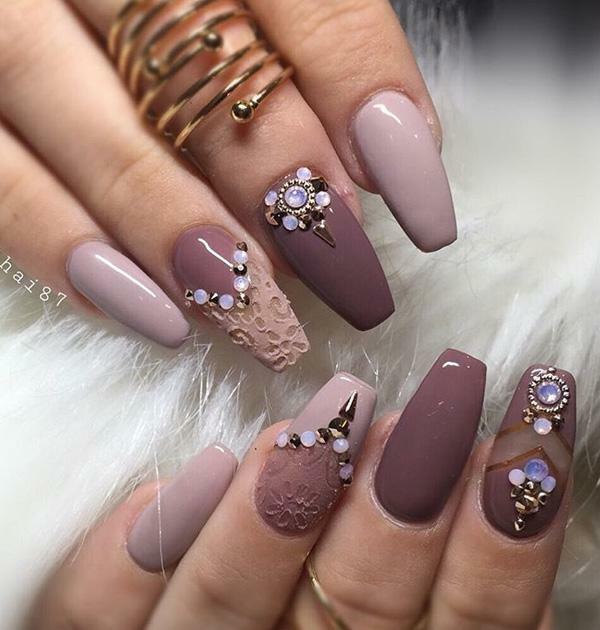 Whether you pefinement ypur nails in the lounge or in your own home, there is a lot of idea, you just needs to let your imagination run wild. If you refinement your nails alone, here are some of the most common mistakes that many do. One of them is filing the nail in both directions, forward and backward. Keep in mind that this is a very bad and leads to cracking. It is best that you file in one direction only. Also, if you didn’t remove the cream for the nail before coloring nail with nail polish, color will not be applied as you want. Many women are wrong, couse they put too much nail polish. Two thin coats of paint will be quite sufficient. After paint color always goes transparent varnish which will help to color lasts longer. And there is of course a cuticle oil, which almost always all of us skipp, while in the salon they regularly applie it. For the ladies who prefer geling nails with UV gel, life is a little easier because it is enough to visit once a month manicure. Nails treathed with UV gel last longer, lasting up to a month, so that you will be spared from almost everyday coloring natural nails. Thera are too much ideas for gelling nails. 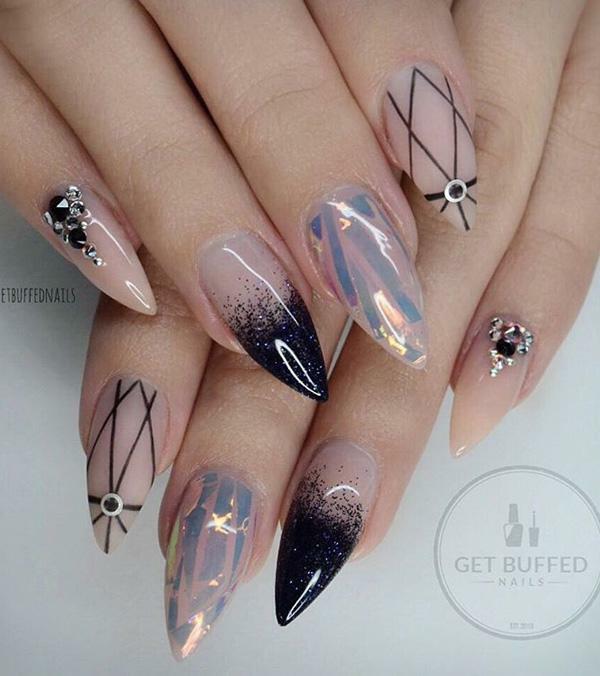 Ver often you can not decide whether you want rounded or square nails, or perhaps harsh. You do not know if you want them to be matte or gloss, in one color or combination od two or more colors. Therefore, dear ladies, the best would be that you in your house decide what you want to do and be ready when arrive in salon. So you will be sure you will not regret after, why you for this variant decided this month. Gelation of your natural nails you make them more solid. 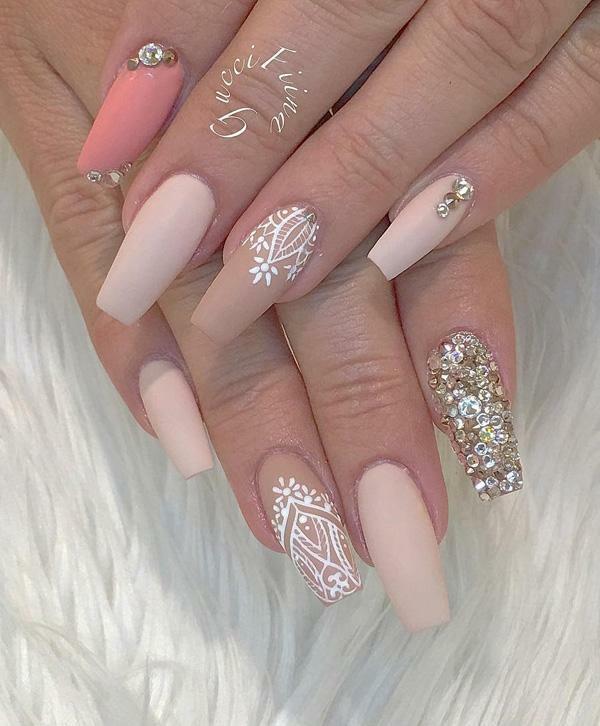 It is very important that you have proven manicure as you have proven your hairdresser. 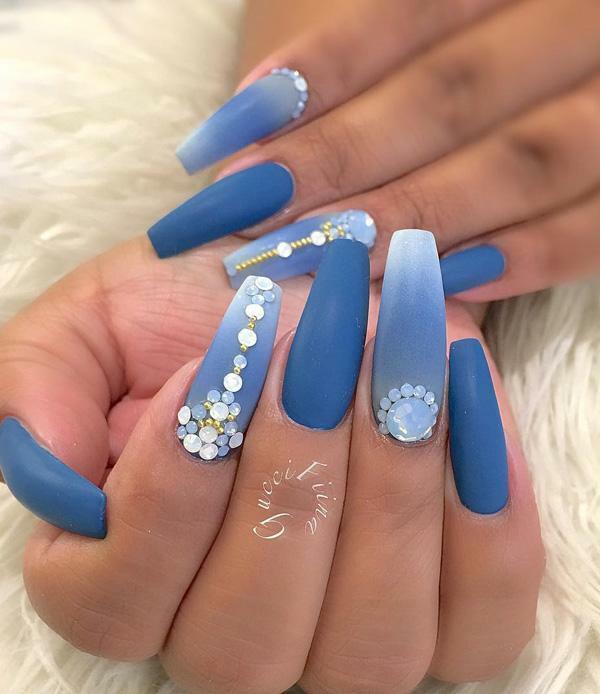 It is true that after removing gel nails will be thinner, but it is very imoportant that you do removing the del the gel in the salon, where manicures will threat them in the right way and prepare them for a fast recovery. There are various creams and gels to give strengthe to natural nails, so do not worry, they will very quickly recover. Gelling is an excellent choice for the ladies with weak nails. The idea for decoration is a lot. I’ll show you some ideas on the pictures below, so if you like some – straight to the salon! 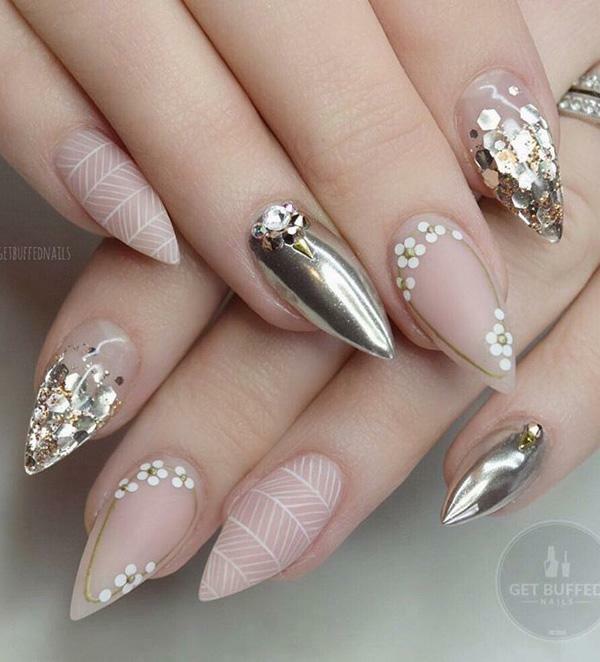 This time we’ll show you how can decorate your nails with rhinestones and glitter. You’ll be like a movie star. Enjoy! 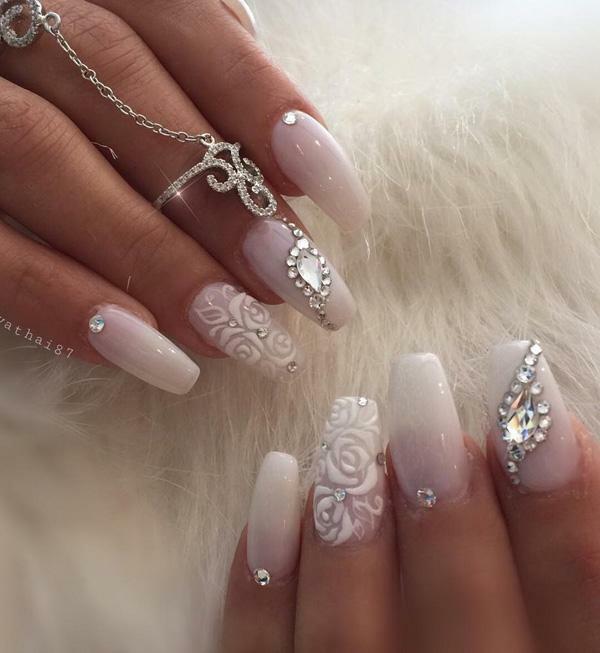 These nails remind me of the Snow Queen. Long, narrow, always modern neutral colors, with lots of rhinestones. Mat nails are worn for a couple seasons. This is a very beautiful dark green, royal green shade. 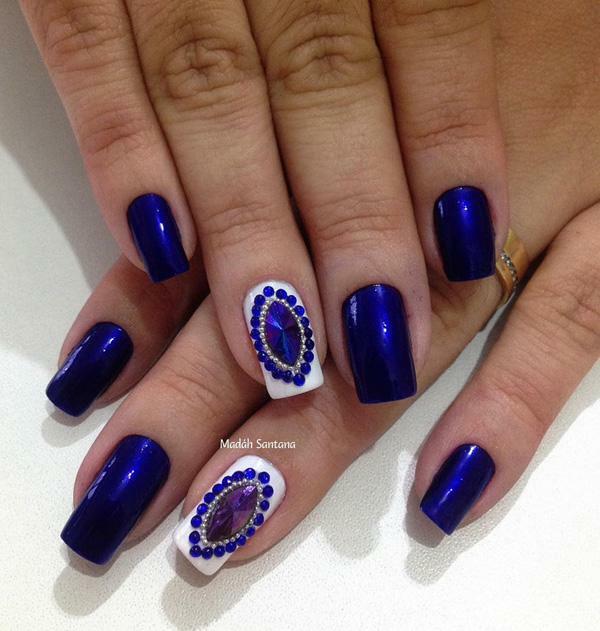 A beautiful combination of dark blue and beige with rhinestones that enrich the whole combination. Your just have to make decision about the length of the nail and shape that best stands to you. 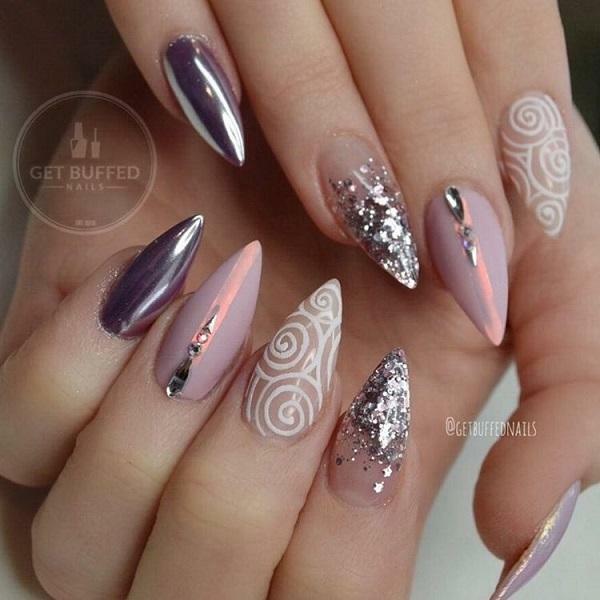 Here we have a combination of matte nail and nail with shiny gel. Glitter gel gives a special note to the whole combination. 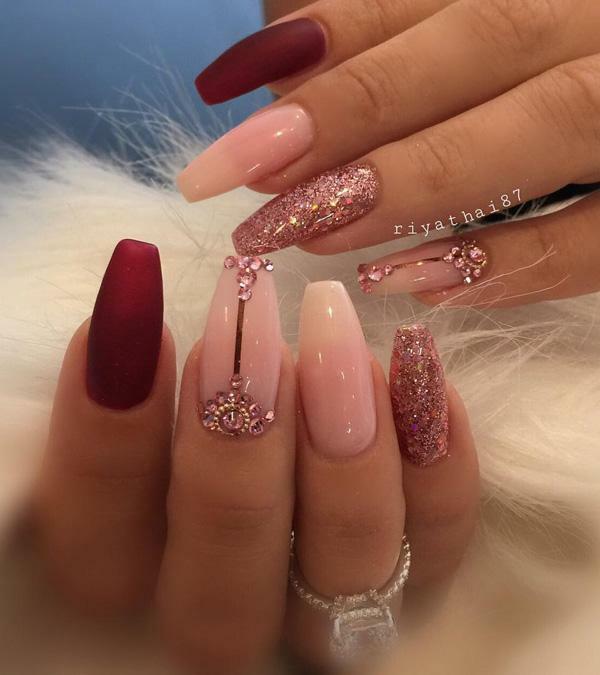 If all nails in metallic color are too much for you, then that color can do on one, two nails of both hands hands and that will be enough to shine. 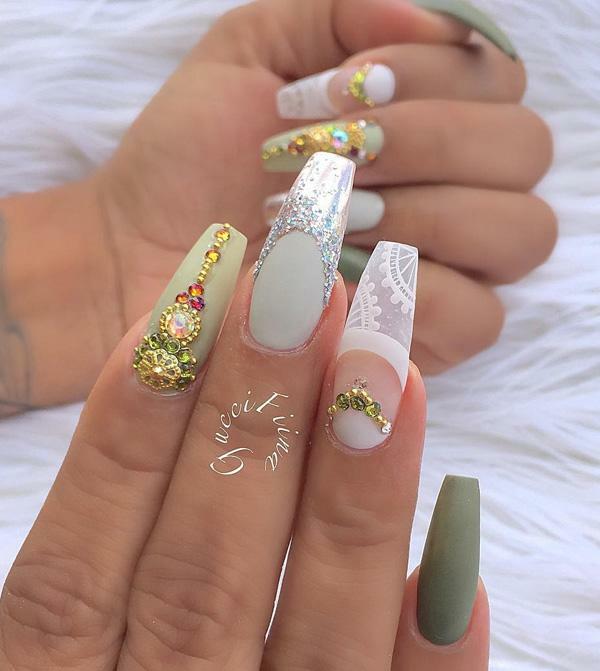 Oval long nails are good for ladies with a wide nail plate because it will visually narrow them, and will look more beautiful. 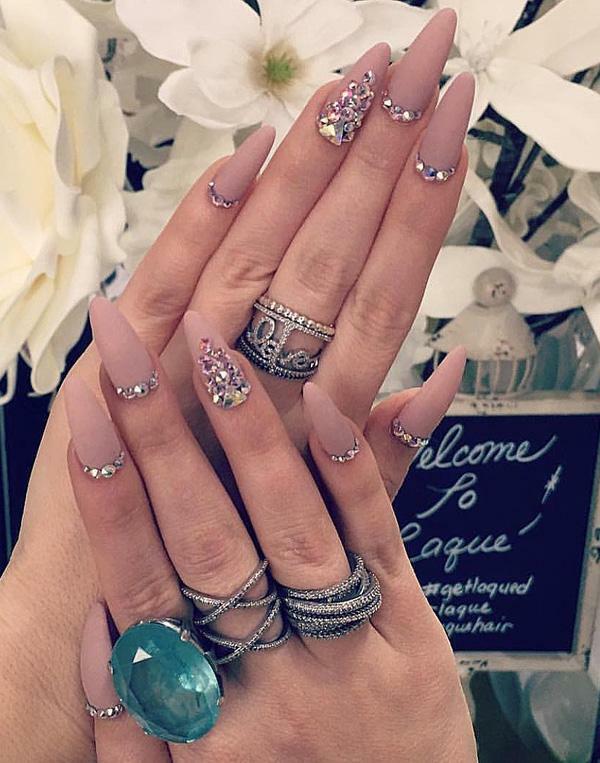 Fourth oval nails are one of the most common choice of ladys all around the world. 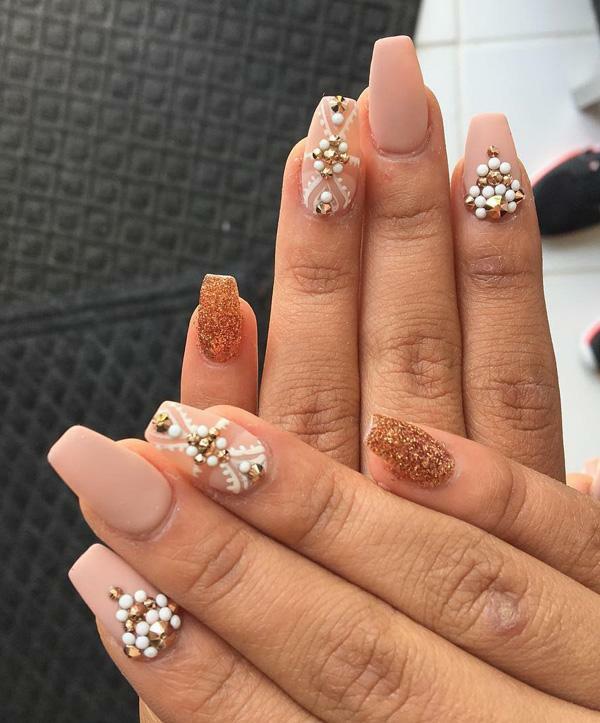 This form is closest to the natural shape of the nail and the natural beauty and natural look is something that is always at a price. If you look closely, you’ll notice a discreet french manicure but in the same color. With that, part of the nail closest to the root of nail is shiney, and the upper part is mat. 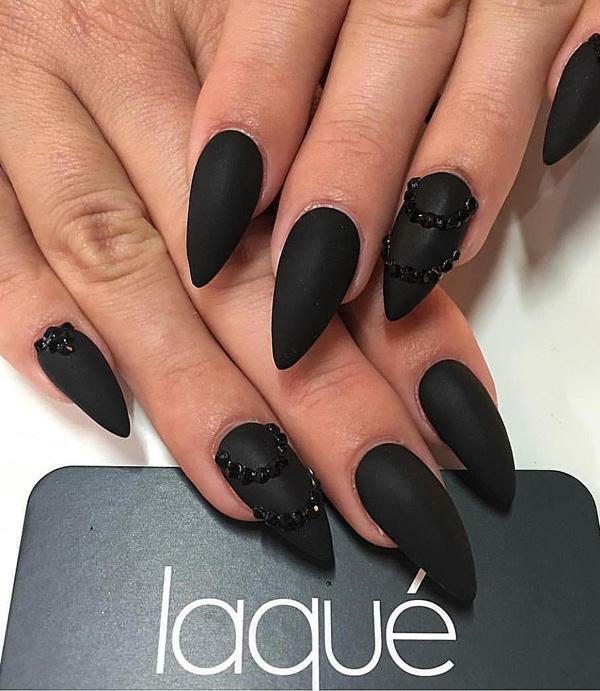 The color of meat is very nice paired with black rhinestones that gives the soul the whole manicure. Black is always in fashion as the little black dress that all the ladies have in the closet. Even one. 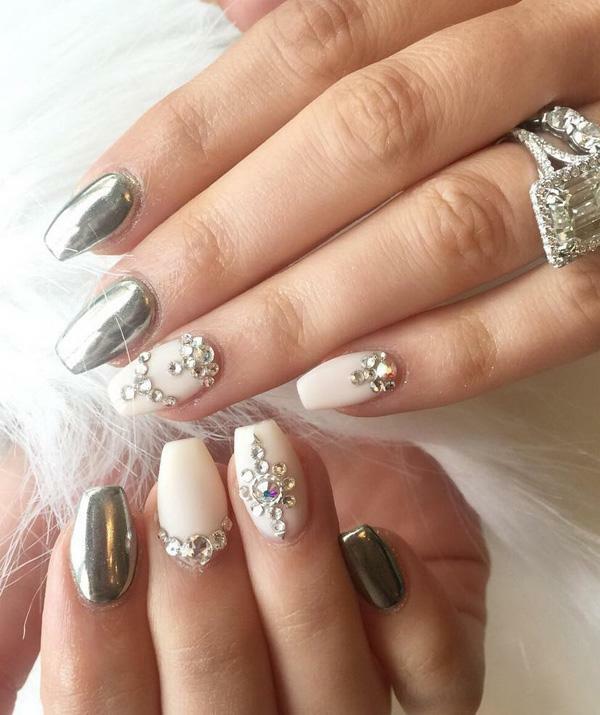 This extravagant manicure is for the courageous little lady, so if you’re like that, go for it. If you have brittle nails short you have to check the operation of the thyroid gland. Because if your nails break at the slightest touch it is a sign that the thyroid is not working as it should. In those cases nail separates from the nail beds, what often is visible to the naked eye. For a gentler feminine lady pink is always the most common choice. It is more better if it is combined with a white that is evergreen. For me the most beautiful stands this color to blondes but also and to brunettes. Franch manicure is always in trend. It is only on you to decide how youu will do it, will it be simple french manicure or a little bit enriched. 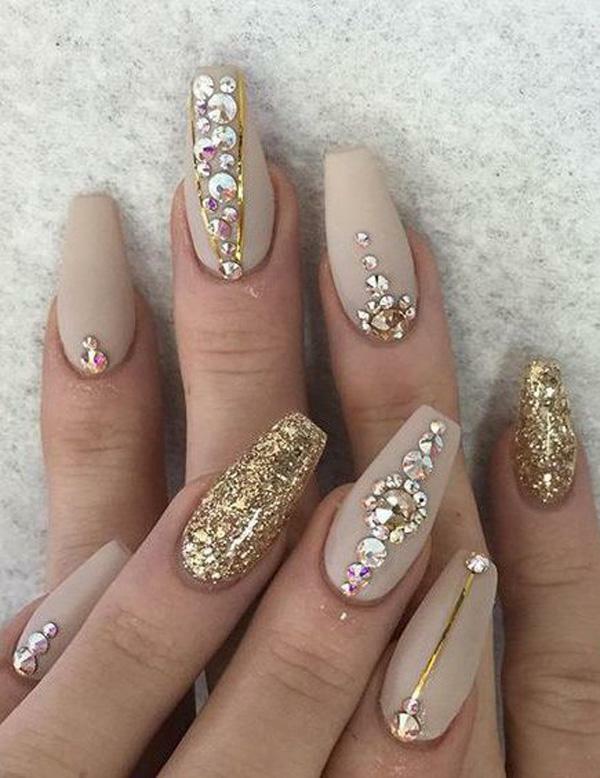 Neutral colors of nails are classic and with it you cna’t fail. Here are nails done in various shades of purple. A special seal leaves the glitter gel on one nail of both hands. A great contribution to the whole look of a hand givs jewelry rings what is interesting as this is in the picture. Your hands will look rich with them, cared for, and above all – beautiful. 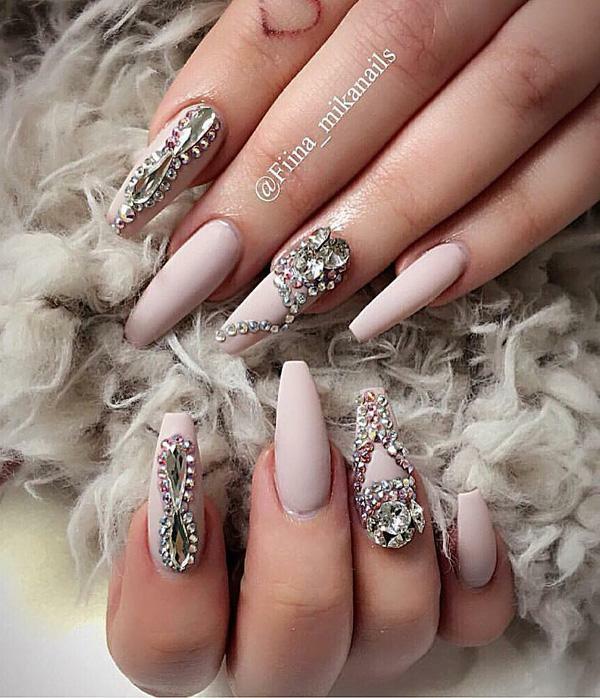 Embossed nails and nail parts with much rhinestones can be a very good choice. If you are a fan of the pastel colors here’s an idea for you this month’s manicure. An excellent ombre with two no similar colors. The transition is very nice and gentle done. And about this effective rings words are superfluous. 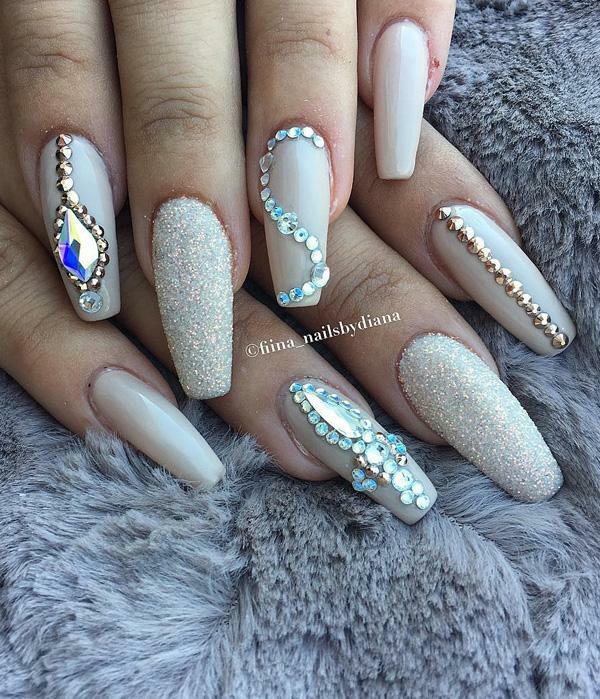 Another proof that glitter gel and rhinestones in combination with matte color on the other nails is great choice. 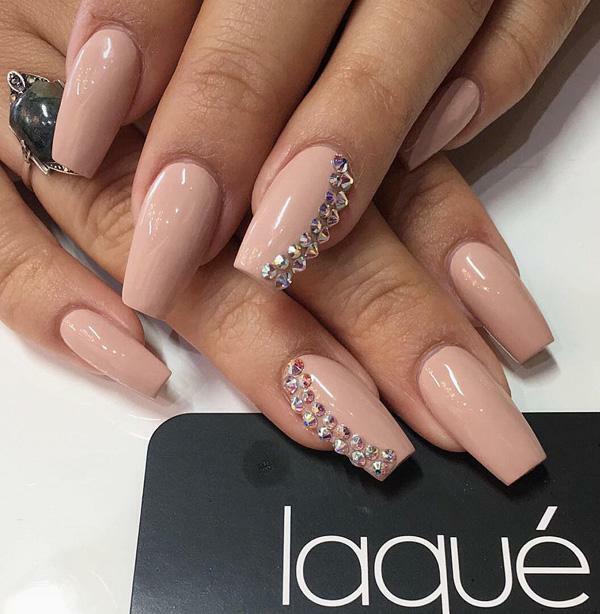 This is a very nice manicure in pastel colors with diamond brilliance and luxurious gold color. 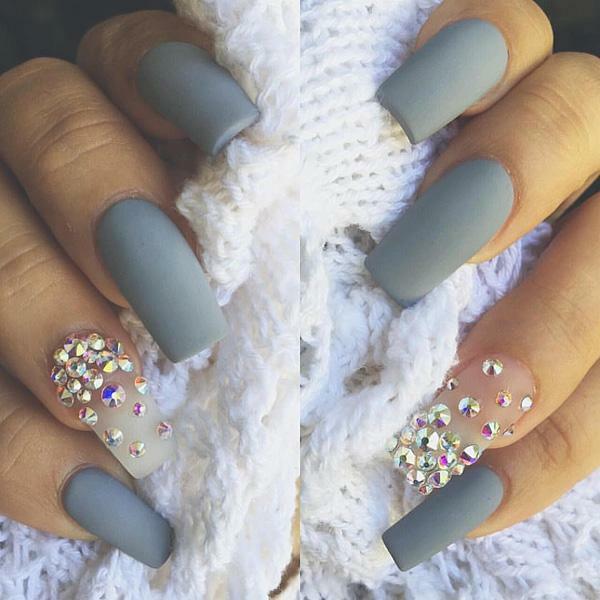 With this manicure in the right clothes you will look great. I would like to combine the dress with turquoise green and gold heels. Rhinestones on one finger on both hands are discreet but very effective detail that enriches the whole manicure. 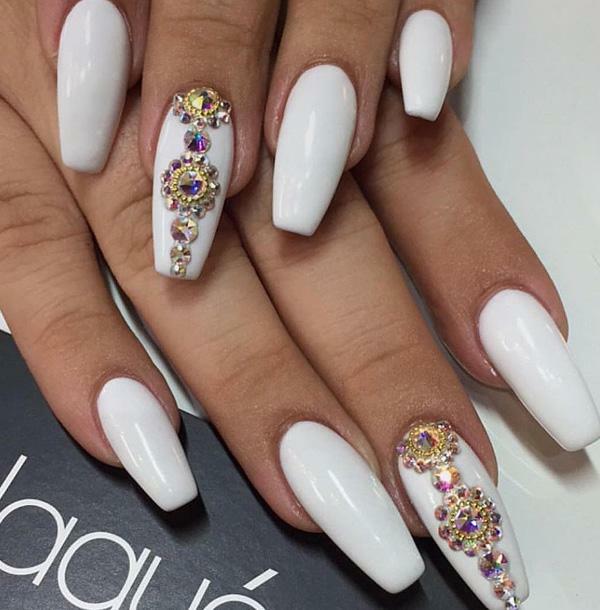 Sometimes rhinestones on whole nails can look crowded, but on one nail may look very effective. 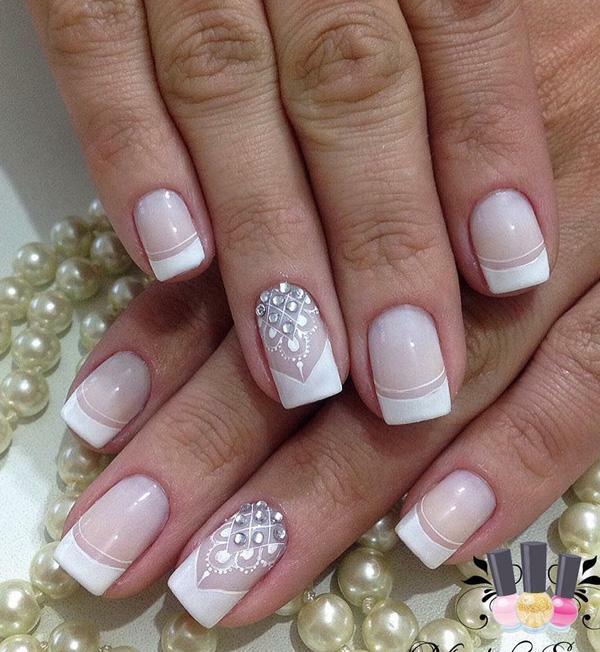 Very nice and discreet manicure, what is not required to do so that you can feel free to take it this season. 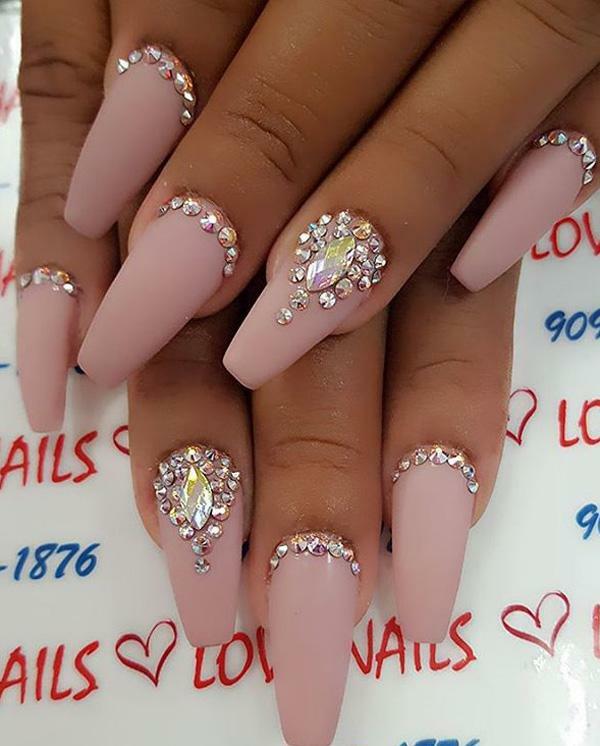 Very popular are Swarovski rhinestones on nails made of Swarovski crystals. Beautiful shine in different colors, which comes from the breaking of light in Swarovski crystals so that it will be a great decoration for your nails. On a white background glittering shine of rhinestones will particularly come to the fore. Turquoise green is for the ladies that is gentle spirit, combined with white patterns looks very interesting. 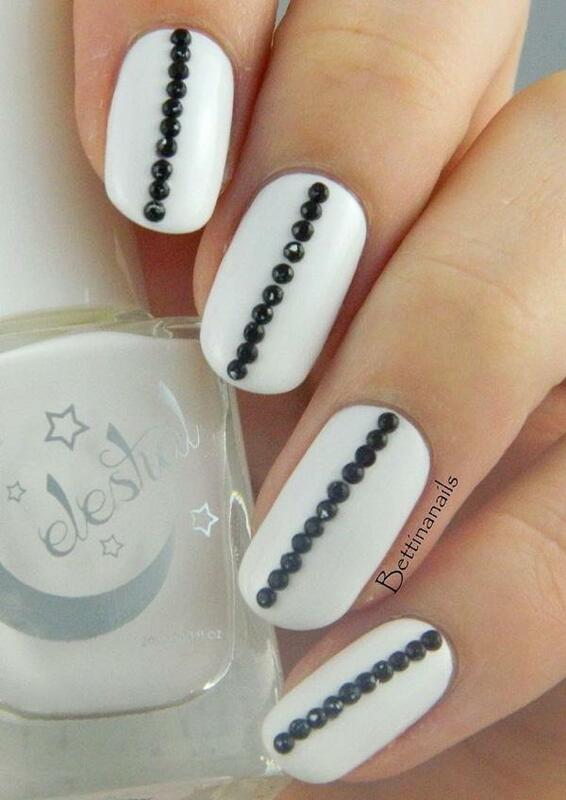 White small pearls give these nails seductive line. 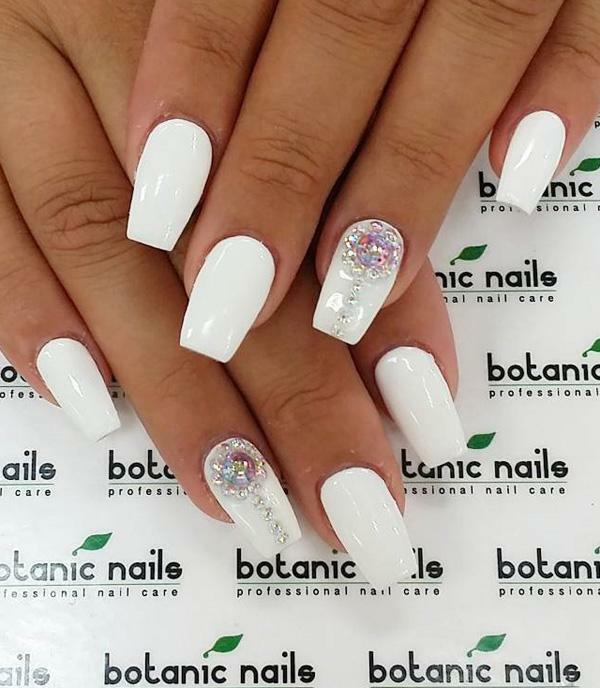 The white color looks good on both, short and long nails, it is important to put it good cause because and the smallest mistakes are very visible. Popular are the mat, pearly , dairy and pearl shades. In combination with other color or special rhinestones come to the fore. 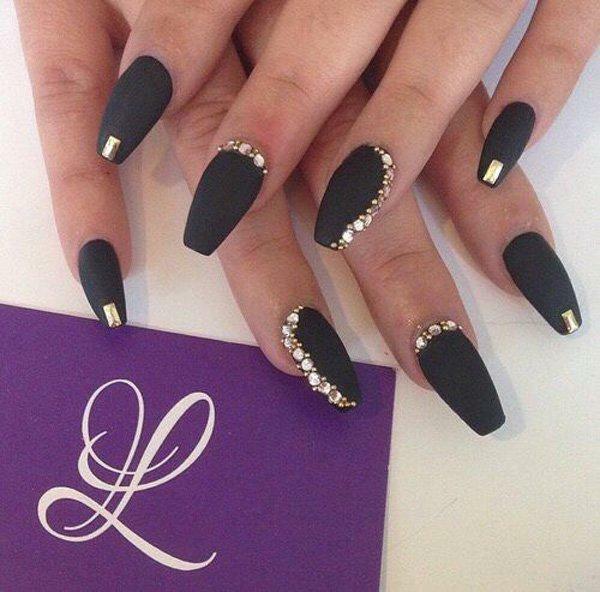 Extravagant black with gold rhinestones is always modern, if you’re brave and bold choose these nails. Kiara Sky produces beautiful products for nail care. In the photo we can see Kiara Sky Soak-off Gel Polish which we can put n our natural nails, and cure 30 sec in UV lamp. It can easily be removed without damaging natural nails. 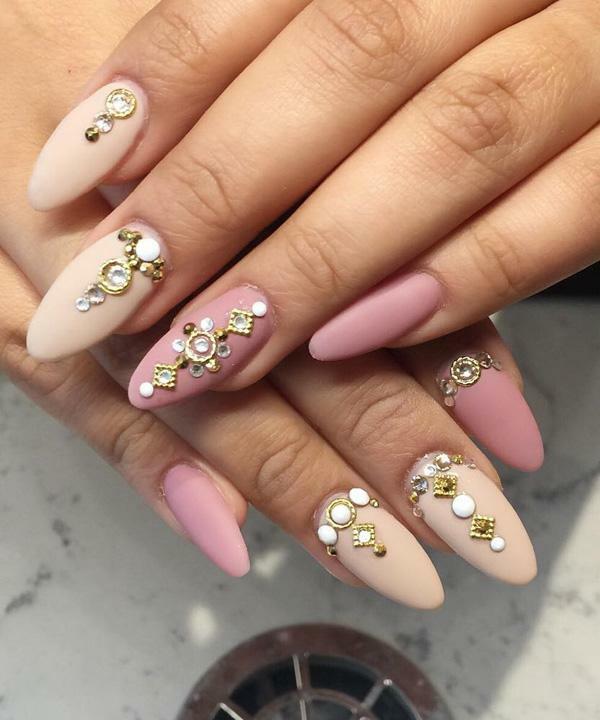 Although almond shape of nails last season was not so popular in fashion, on the streets it is particularly in young generation. 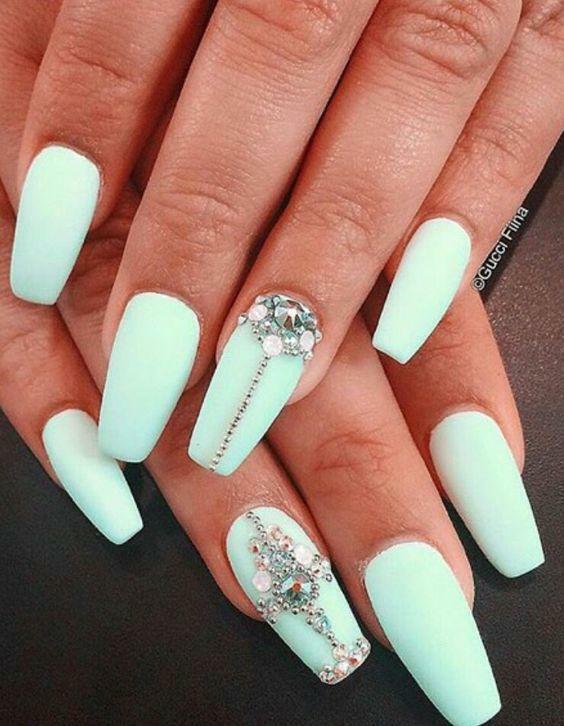 Long nails are very richly done, whose pastel tones complemented by dark green nail on the nail of little finger. If you’re going to the main party in city this combination will be a big hit. 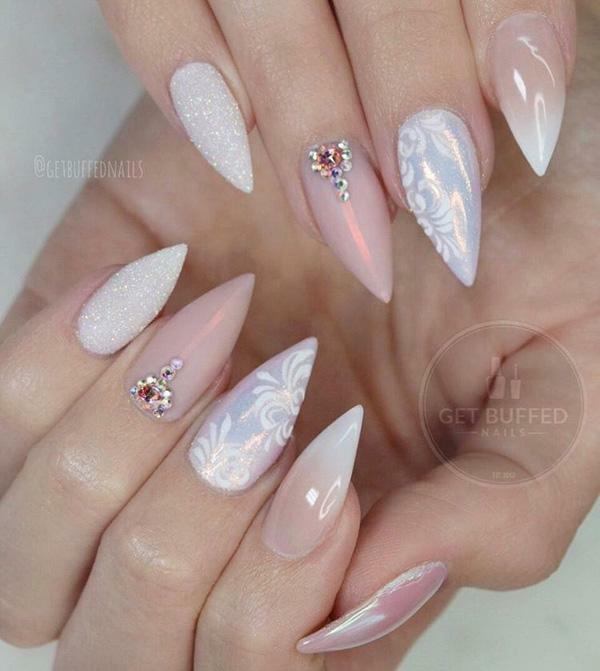 Almond shape of nails, pastel shades, beige color combined with white will make your hands look gentle and cultivated. It is very important, if you are doing a regular manicure and dry the gel under the UV lamp, to the take care of your hands. Be sure to pat your hands nourishing hand cream every day. If you want that your nails be well done is very important to regularly change the bulb in the UV lamp. Bulbs should be changed every 4 to 6 months, depending on the frequency of using, or when you notice that your client nails becomes yellow, break up, or raise. Metallic high-gloss colors with excellent hiding power, your nails will be shiny and glamorous. For the upcoming holidays, you can choose a nail in these tones. These nails remind me of the universe with the dark blue and black rhinestones on her ring finger. Black patterns can nice to emphasize the light color on your nails. This is a sophisticated combination, rhinestones give an elegant look and glamour to this combination. Gentle tones of rose color flatters almost every lady. If you are going to rest on a beach far from the urban center, complete your look with these colors of the sea and the sea depths. Wonderful done ombre at some fingers will refresh every one-color combination. A pearls and rhinestones in white will remind you to the depths of the sea and the waves. This combination of pastel colors and rhinestones in gold, are a rich combination that reminds me a bit, I must admit, reminiscent of luxurious side of the Near East. 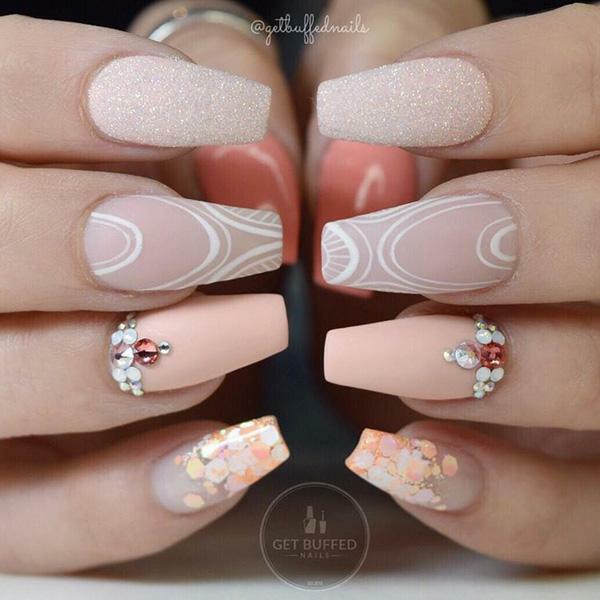 With these nails your hands will always look cared and nice, and you will feel seductive. 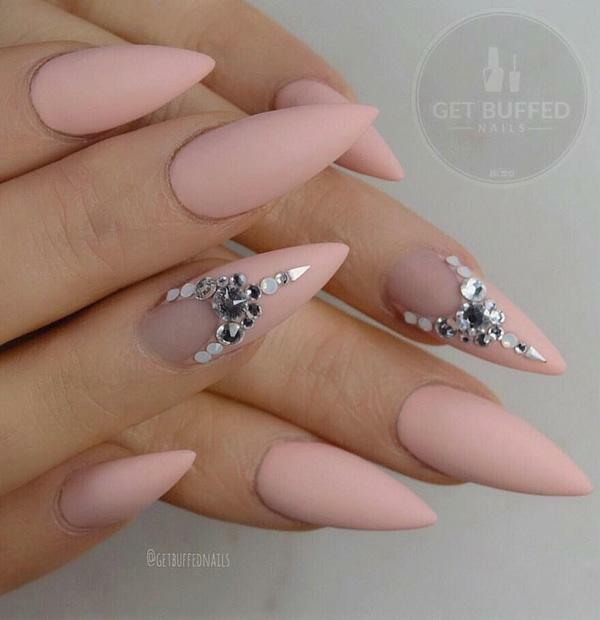 Another idea how to do your nails, in almond shape. But I must admit, rings and bracelets pretty much contribute to the appearance of your hands. 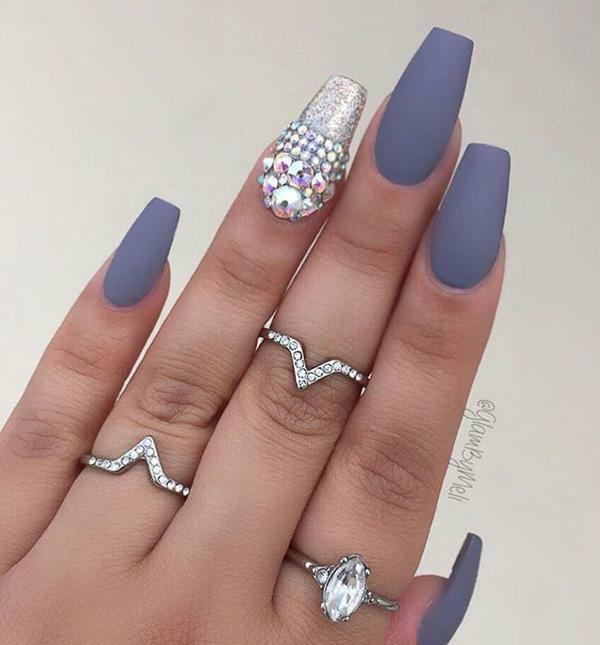 Matte nails are a selection of this lady also. 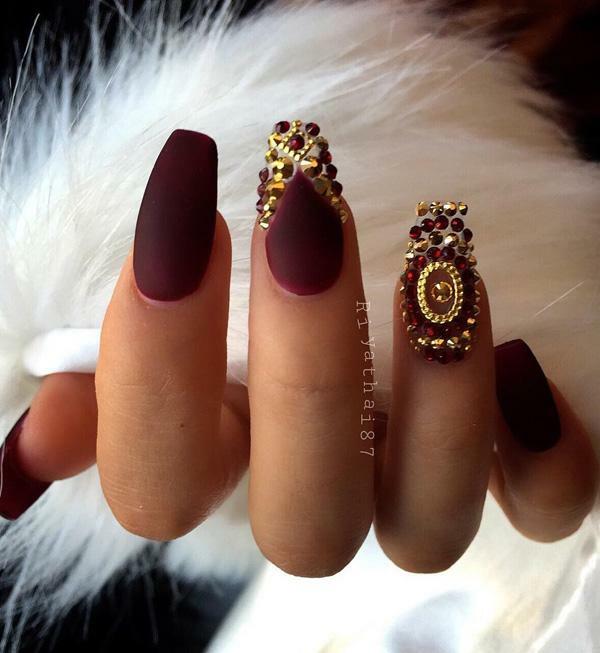 King’s dark red color is always in fashion, and with gold rhinestones looks very luxurious. Except gel nails can extend and with acrylic. The difference is that the gel is dried under a UV lamp and acrylic on air. Gelling nails is great for quitting biting your nails from which suffer many people. After a while the nails are fully recovered from biting. 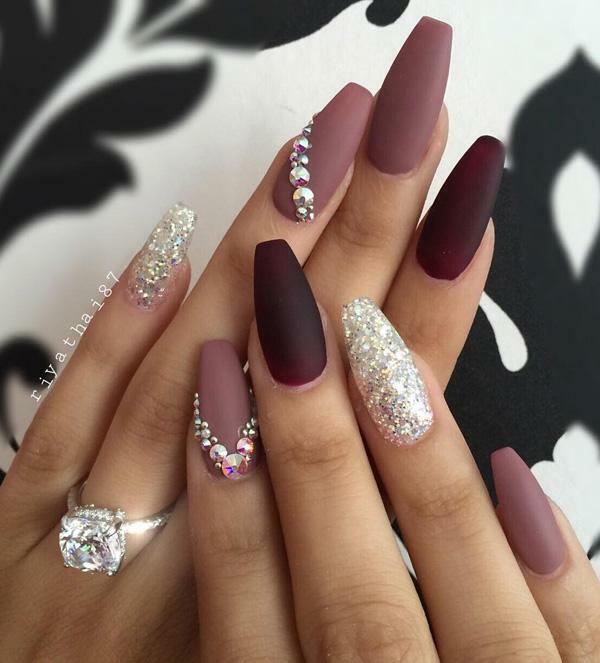 Here we see a combination of metallic colors and matte nails with rhinestones. 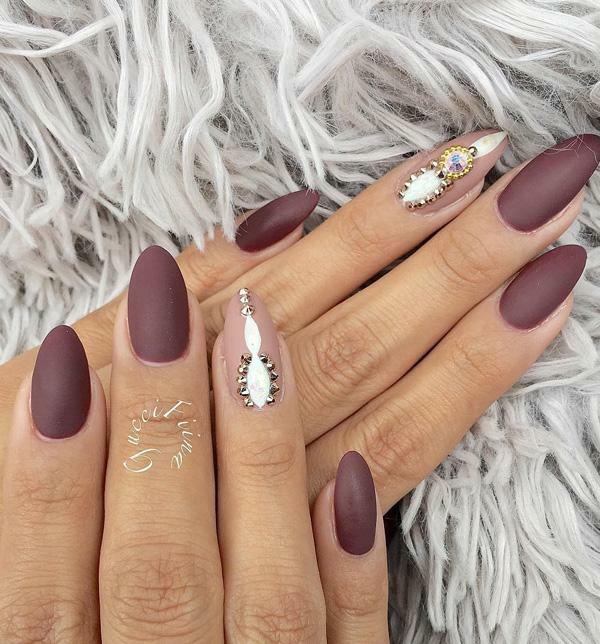 Matte nails are perfectly served to minimize big gloss of metallic color and zircons. When we talk about earth tones, they are in the whole fashion industry for long time popular. Same is when the nails are in question. 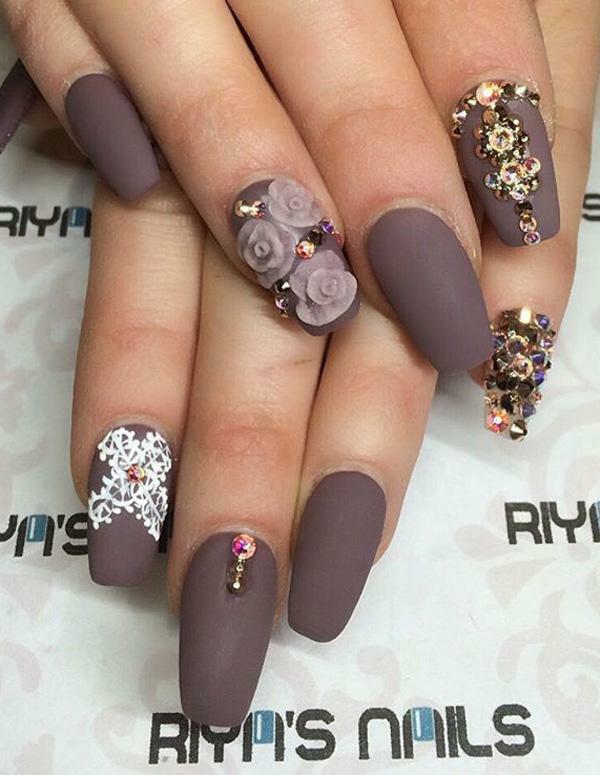 To this brown roses give softness, zircon luxury, and white detail on the forefinger refreshes this autumnal colors. 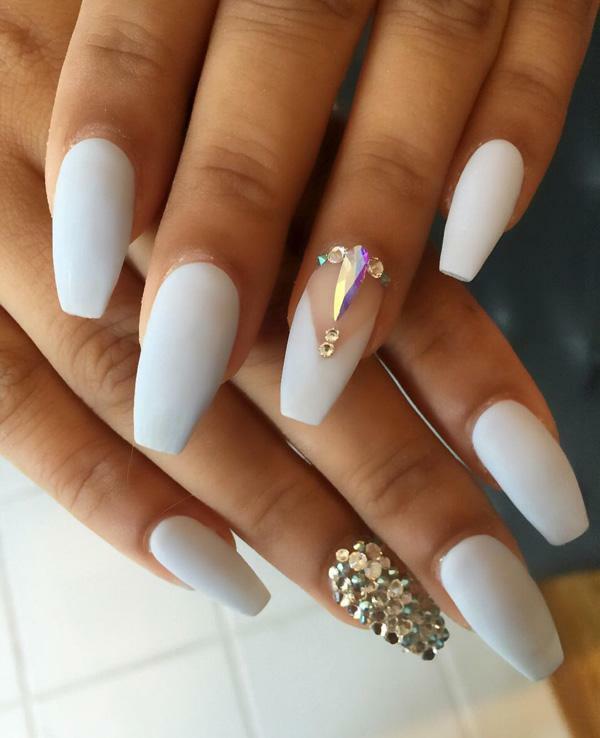 This form of nail fits almost all the ladies, visually narrows and elongates nail. When choosing the look of your nails take special care because everyone can’t wear everything. If you are employed take care about the length of your nails, avoid very long nails if it can interfere you in donig your job activities. 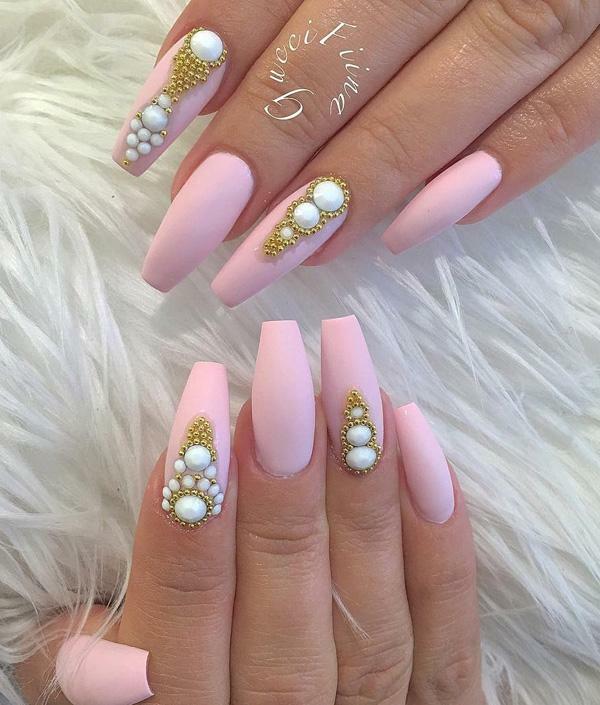 The condition for beautiful nails is not to be a long, also short nails can be beautiful. 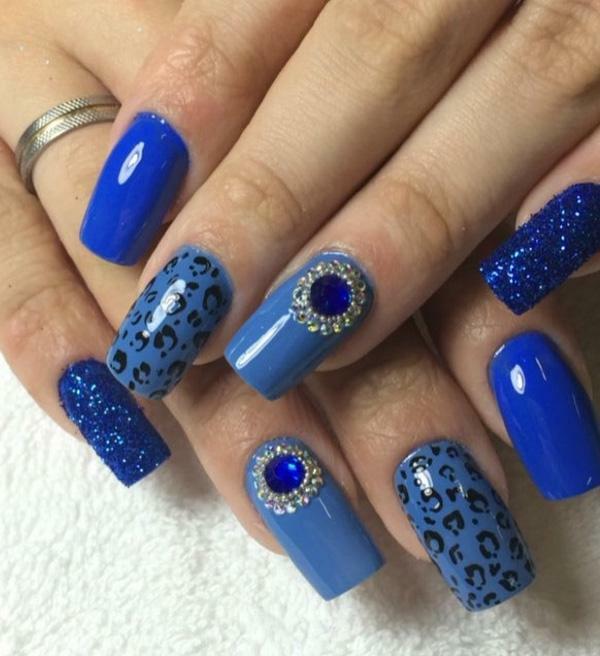 Royal blue color of nails, moderate length, this is an excellent choice. 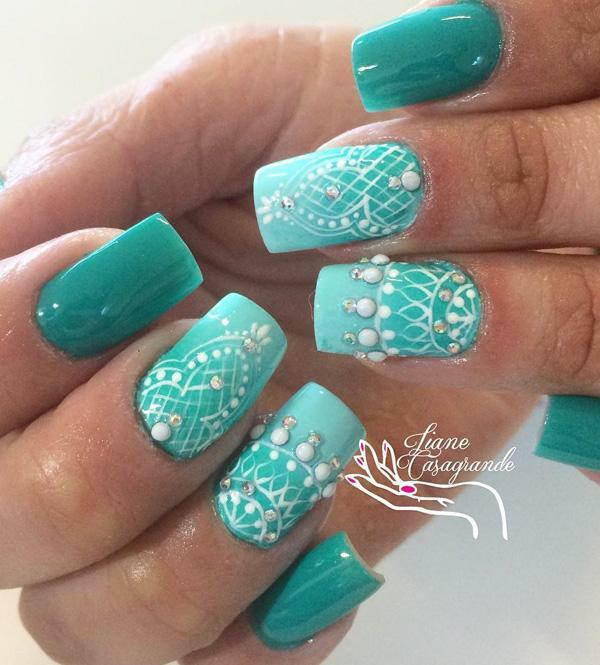 White nail is there to refresh the entire combination and it is naturally decorated with rhinestones in blue color. Milky white nails wonderful stand on suntanned skin, so if you have recently returned from the sea, this could be your choice. Sometimes the little things can contribute much to the overall impression as the thin gold line on the little finger. 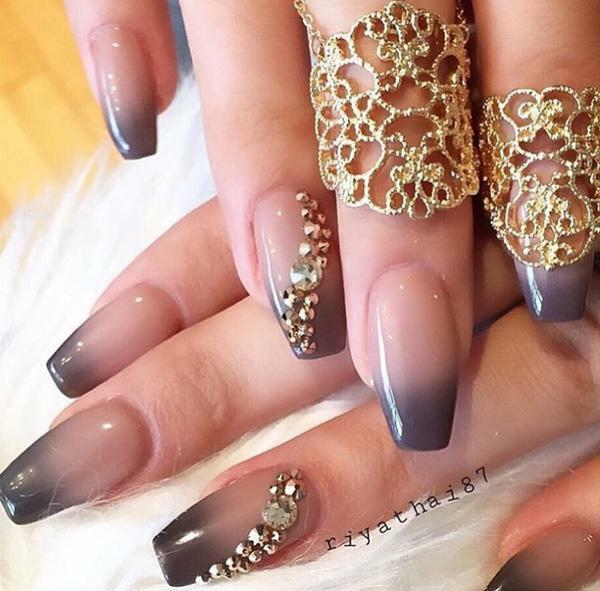 Anything else would be superfluous beacuse nails on ring fingers are very richly decorated.. I extremely like a golden color and I think it can elevate each combination, and even do the simplest glamorous.